#1. 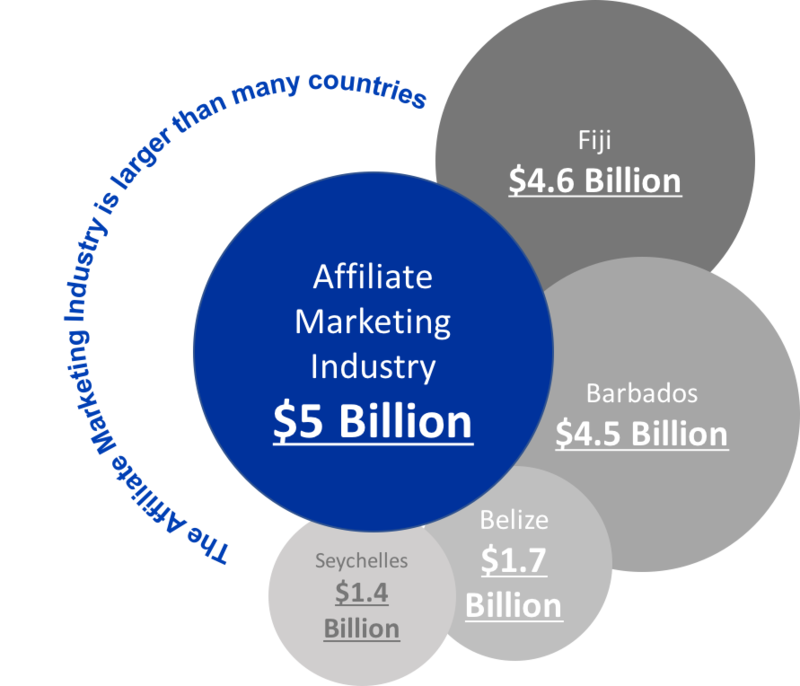 US affiliate marketing industry generates nearly $5 Billion in revenue each year. #3. The affiliate marketing industry is estimated to grow at an average annual rate of 16.6%. The industry is expected to reach annual revenues of $6.8 Billion by 2018. #8. Nearly half of Affiliate Marketers (48.36%) make under $20,000 per year. 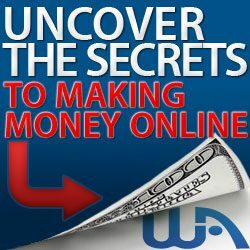 The majority of affiliate marketers barely earn any income from their online business. Only 3.2% make more than $150,000 per year. A scary fact that you as an affiliate marketer should be aware of. 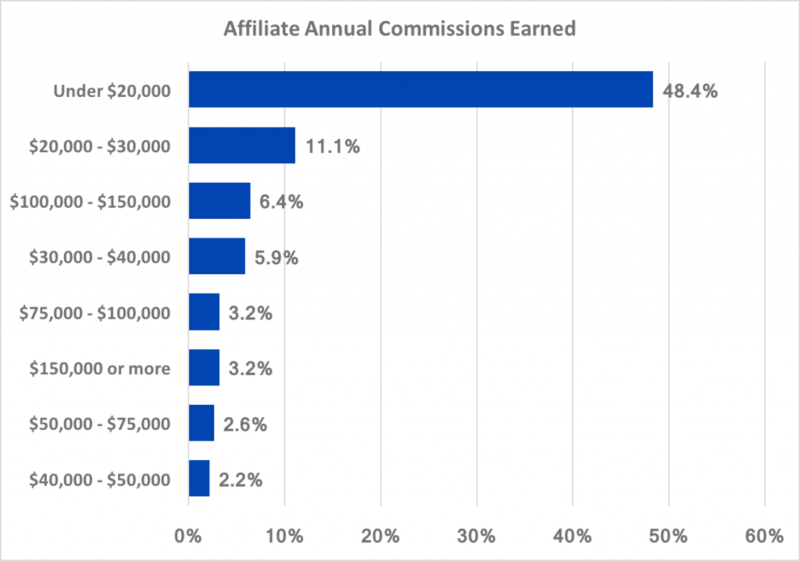 Why do most affiliates earn less than their dream income levels? Read on. #9. Lack of “training” was sited as the #1 reason online businesses fail. Without the right training most affiliates are not able to reach their full potential. Affiliate marketing is a legitimate form of marketing. As such, it does require some training to implement successfully. Don’t be a statistic. Click here to learn more about the most affordable and comprehensive online training to help you improve your Internet-based business. Survey respondents also indicated that insufficient “content” and “video creatives” were other reasons their businesses weren’t doing as well as could be. #10. There were 3.835 billion Internet users in 2017. 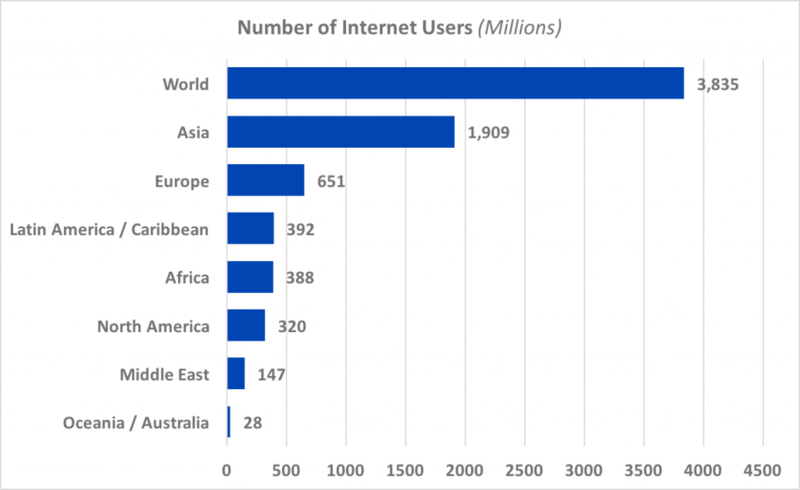 The number of internet users worldwide is almost half of the world’s population. And larger than the combined populations of North America (359 million), Europe (743 million), China (1.38 billion) and India (1.32 billion). Source: to Internet World Stats. 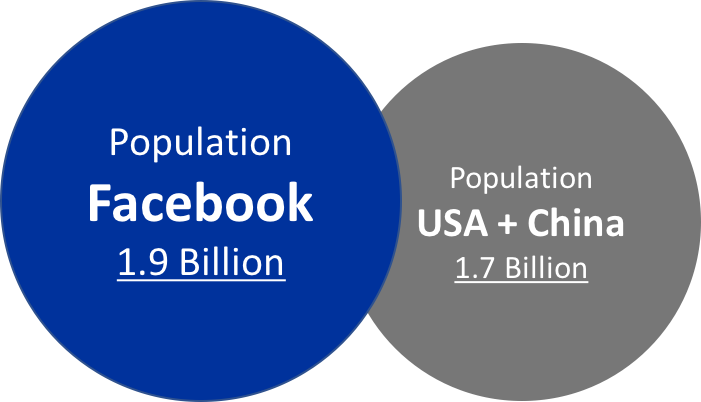 The number of Facebook users is actually larger than the combined populations of China and the United States. This data is based on registered Facebook at the start of 2017, according to Facebook. #13. 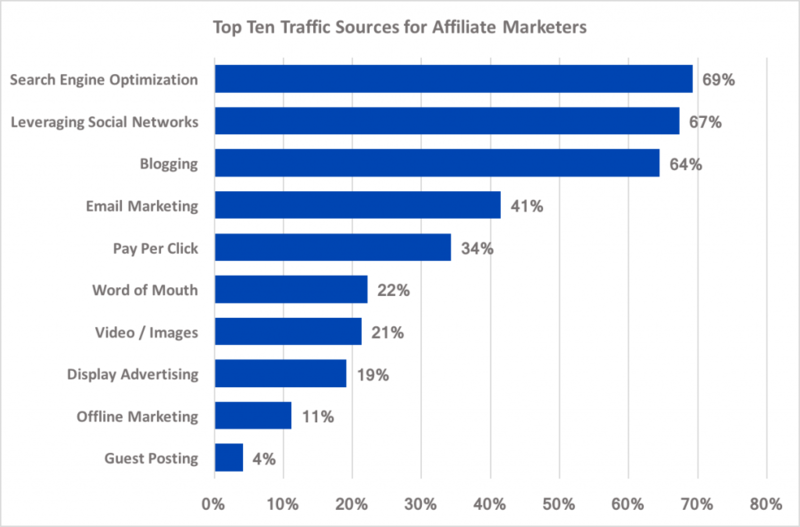 The main traffic sources of affiliate marketers. Affiliate marketers in AffStat’s 2016 survey said that they get their traffic from these top three sources – SEO, social networks and blogging. #14. Google is the largest source of searches. 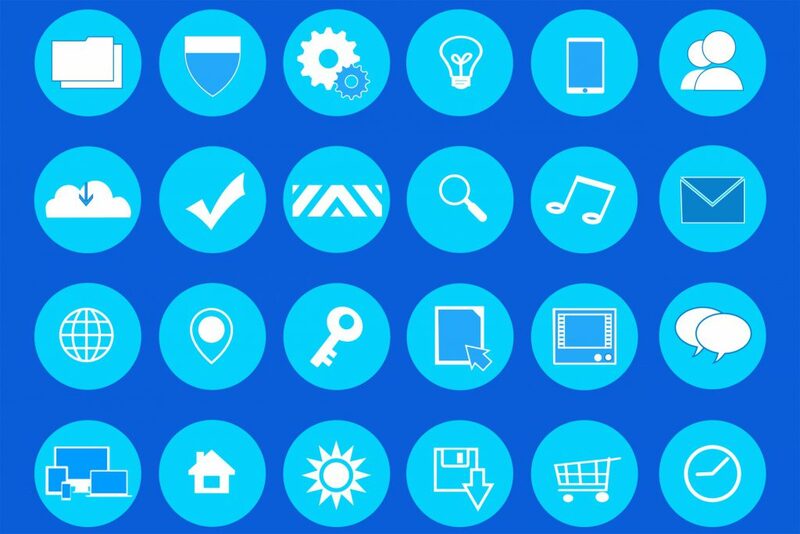 There are over 5 billion Google searches taking place everyday, according to Google. This accounts for two-thirds of total search volume on the Internet. 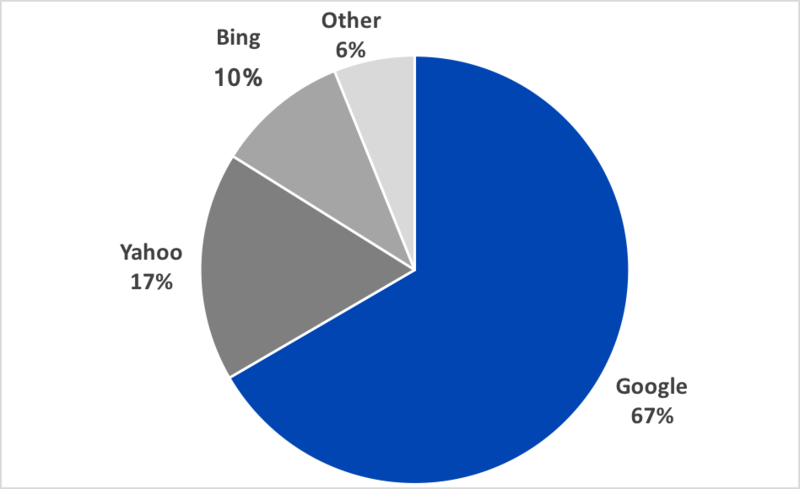 Yahoo accounts for about 17% and Bing for around 10%, according to ComScore. #15. 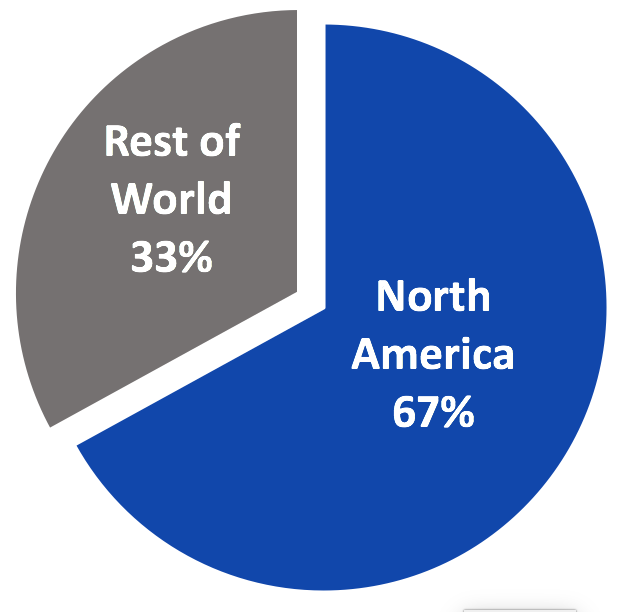 Two-thirds (67%) of Affiliates come from North America (USA and Canada). #20. 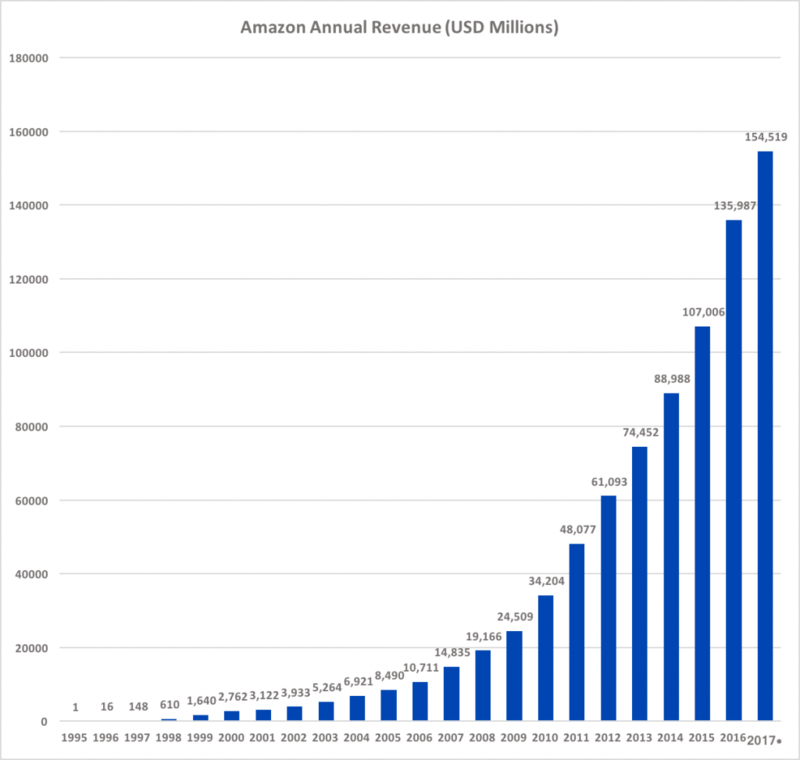 In 2016 Amazon’s revenue reached $136 Billion. This represented an annual growth rate of 27% over 2015, according to Amazon’s annual reports. It is expected that Amazon’s revenues will reach $154.5 Billion in 2017. The last two statistics point to the importance of having responsive websites. If your website cannot be viewed on a mobile device then you are literally throwing away your income. #30. 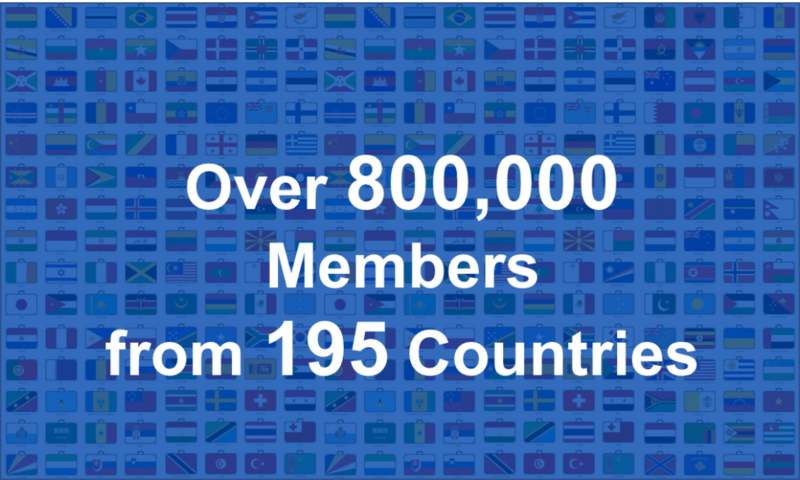 There are over 800,000 affiliate marketers at Wealthy Affiliate. Oh wow I love this post! I just learned a whole lot about and industry that I honestly thought I knew more about lol! After reading these facts, I actually feel even better about making a decision to put some effort into affiliate marketing and I honestly think that anyone who is in that decision making process can really take some steps after reading this post. And the ones that aren’t necessarily positive have a great way of providing a reality check which will in return help with success. Great work. Thanks for your comments Kayla. I’m really pleased and excited that I was able to help you confirm your decision to continue as an affiliate marketer. All the best to you as you continue on your affiliate marketing journey. Wow! lots of facts and figures!..You have really done your homework! Thank you for this interesting info! I’m really happy that you found my article interesting. It also means that you have a huge opportunity to grow your bubsiness as an affiliate as well. Part of the challenge of affiliates outside of the USA, Canada, Europe and Australia is the abbility to get paid. Paypal has limited options for many countries. For example where I come from, if I have an ecommerce site and I use Paypal my clients can only pay me directly from paypal (PayPal to Paypal) and not via a credit card (Credit card to Paypal) so that limits me. This was such an awesome article to read. 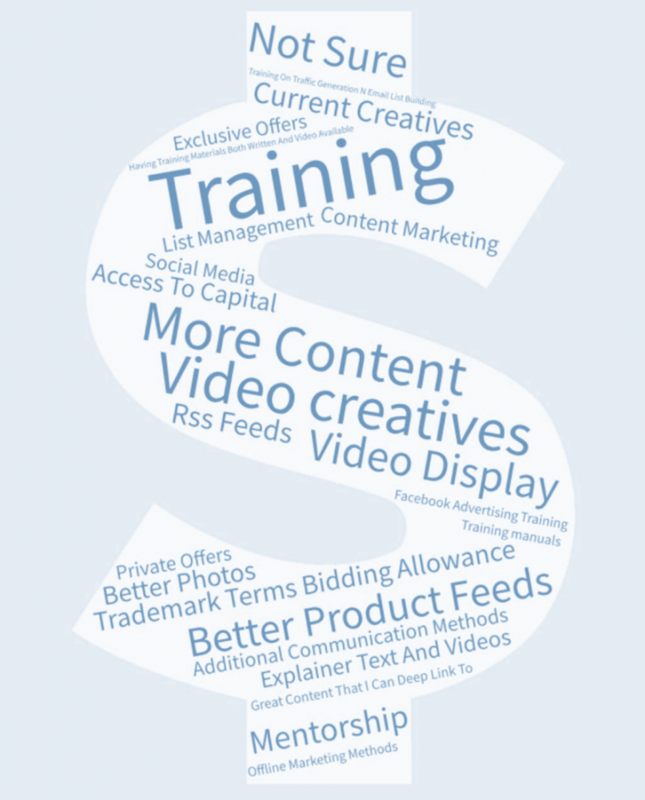 This was truly 30 amazing facts about affiliate marketing. As someone who does affiliate marketing in my own life, I was able to take away a few very useful facts that I can directly apply to my own business. The second fact that I’m able to directly apply into my own business goes back to the power of social media. 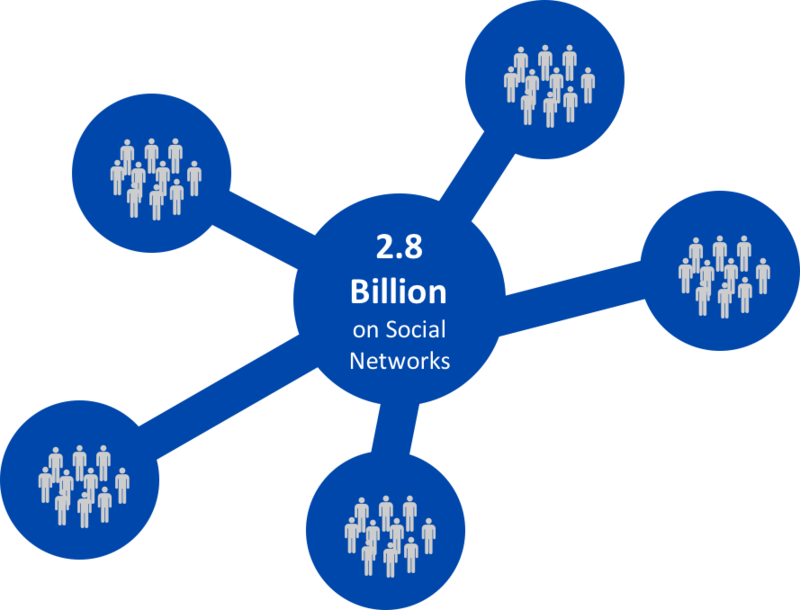 Facebook having nearly 2 billion active users. That is surely an area that I am not leveraging properly. In fact, I was just doing some reading on using Facebook ADS to generate traffic and now I am even more motivated. Overall, this article made for an excellent read and time well spent. What was the most astonishing fact to you that you unearthed? Thanks for your comment, Justin. I’m really happy that you enjoyed and benefitted from this post on key facts about affiliate marketing. For me, the one that stood out the most was the fact that nearly half of affiliate marketers make under $20,000 a year. There is always this hype about getting rich and all that but in reality, it’s really hard work. That’s why I did a post recently on the hard work required to be successful in affiliate marketing. Poeple just don’t get it. They forget that running a business is hard work, especially in the early days. It does get easier over time once all of your systems are in place. But to get those systems up and running time, energy, effort and money are all required. Thanks Brandon for your comment. Everyone seems to love this post and I am happy that you are one of them as well. Yes, you are correct, all evidence suggests that affiliate marketing is not going to slow down anytime soon. Now is the ideal time to get on the affiliate marketing bandwagon. Kevon, love this article! Very informative! Some eye opening statistics and I love statistics. I didn’t realize affiliate marketing had this much impact on the world’s economy – especially as it pertains to online business. It really does show that affiliate marketing is not only not dead, but is really still in its infancy. There is a lot of room for growth. As far as Wealthy Affiliate, I knew it had a membership of over 800,000, but didn’t realize just how big of an impact it has in marketing training. Thanks for your comment Don. 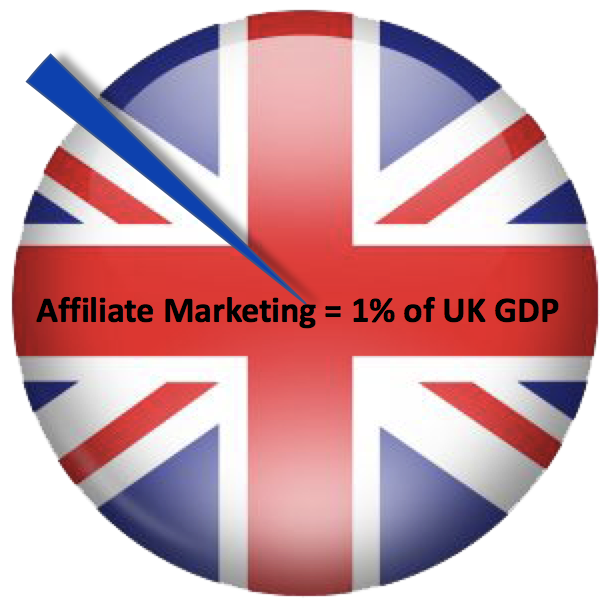 Yes, the affiliate marketing industry does have a significant impact on the global economy. And what is even more interesting (I guess I did not mention it in the post) is that the industry was growing (both on the supply and demand side) during the recession of 2008. Many people who lost their jobs turned to the internet and to affiliate marketing as a solution. Some people have even never taken up another job again because affiliate marketing was not only their lifesaver but also the only option that made real sense for their family and their future. very nice post with a great tie in at the end. great work. I had no idea about most of those facts and you did an awesome job of doing all the research for the post. Thanks so much Brent for your comment and vote of confidence. I try my best to offer real value for my followers and readers. All the best to you my friend. Some interesting info on the industry, amazing to see it growing as well as it has done. There is more and more marketers joining each day and newbies wonder is there enough left of the pie for them. I say yes as more and more new products are being released every day and more and more end users buy now online. It can only get better. Also just checked WA and there are over 900K Kyle is following to think when I joined Nov 2011 there were about 100K. You are correct. The industry is growing both from a supply perspective (more affiliates and more products) but it is also growing on the demand side (more people are shopping online). So even though more affiliates are coming on stream the pie is also getting bigger. 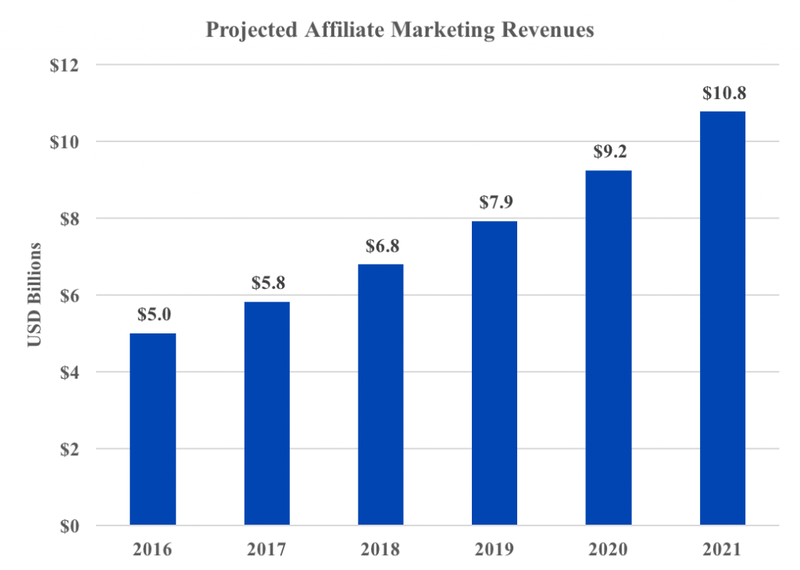 So the affiliate marketing industry is only expected to grow and grow. And consider that other countries in addition to North America will begin to take up affiliate marketing as a legitimate form of marketing their goods and services. Anyone say China? Imagine what the affiliate marketing industry would be like if Chinese and Indian companies start promoting their products through affiliate marketing. Maybe we need to start learning Mandarin or Hindi to get it on the action? Great to hear that you enjoyed this article, Maurice. I’m glad it was useful. Thanks for sharing,it is good to see how you break all of this wonderful information down and explain its so well. Your post is awesome and a great help. Thanks Norman. Was there anything in particular that stood out for you? 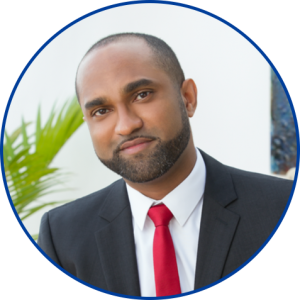 Kevon, all of the above are extremely interesting facts about affiliate marketing, but two really caught my attention and tickled my curiosity. As a fellow affiliate marketer, I beg to differ that CJ may be the vastest marketplace for affiliate programs, but it primarily caters to USA market. Europe based lasses like me do not feel there is much on offer that my business would benefit from. 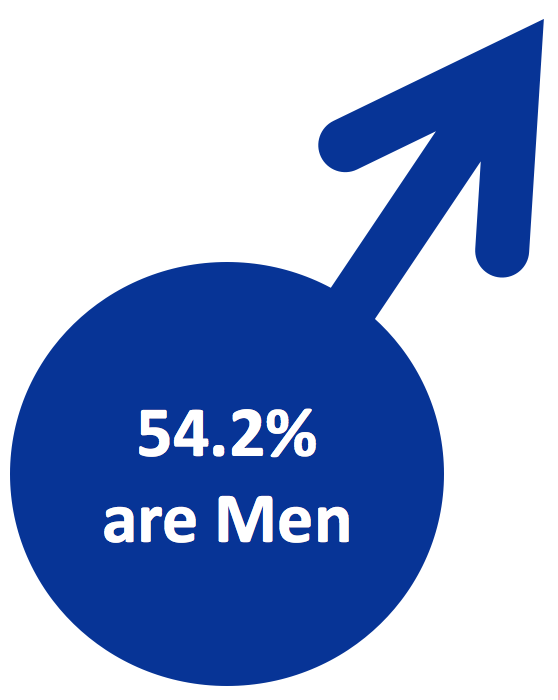 The other thing is that the majority of affiliate marketers, albeit by only some 3%, are men over women. Why, I wonder. I see affiliate marketing as the ideal solution for stay-at-home mums, where they can combine taking care of the family and of the household whilst bringing in an income. Surely that should fare a better deal for women!! Interesting points Guila. Considering that North America constitutes two thirds of the Affiliate marketing industry it is not surprising that a North American based affiliate program is one of the top ones world wide. Also you have to consider a few points why there may be more men than women. 1 is that men are generally higher risk takers are are more proned to starting a business. I also checked Wealthy Affiliate, they also have proportionalely more male than female visitors to their page (based on Semrush results). But consider that the statistics presented on this page was based on a survey of around 5000 affiliates. 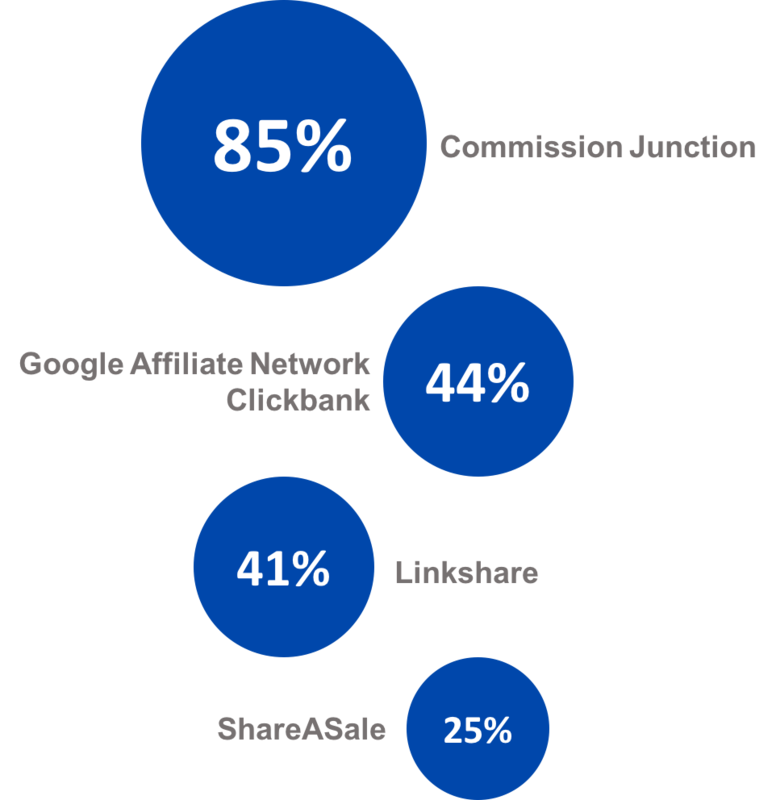 While it may be statistically significant, it is only when you survey all affiliates will you get a true picture of the industry’s breakdown. But I say 5000 is a good number. Hope this helps. 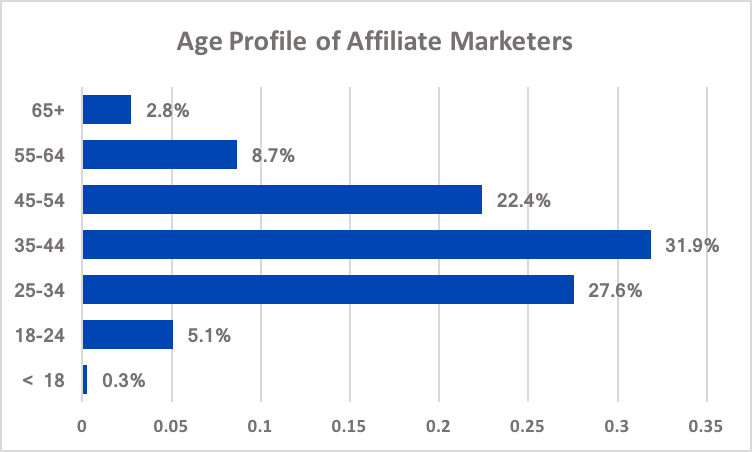 Well, I’m not quite in the age range for most affiliate marketers, but I’ll be there in about 5 years, lol! I guess I’m also in the minority (being a woman). 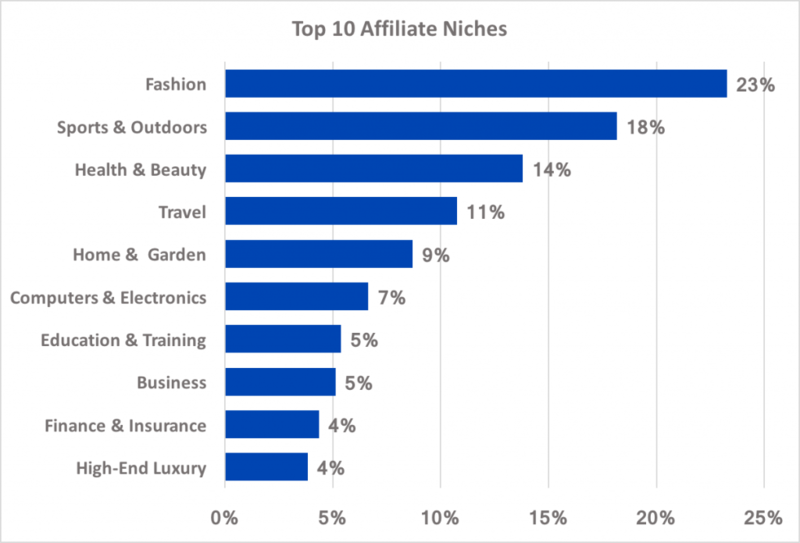 Some of the facts did surprise me – like the fact that most affiliate sales come from SEO – I would have thought PPC would be higher on the list! Thanks for this. This is awesome information for anyone thinking about affiliate marketing or for those who are already doing it! One question though: I was surprised about the the lack of sustainable income made from internet marketers. Does this statistic include those who try it out and then quit, or is that those who are actually giving it a go for the long haul. $20,000 seems low for people wanting to do affiliate marketing full time – if they’ve been in it for years. Any advice? 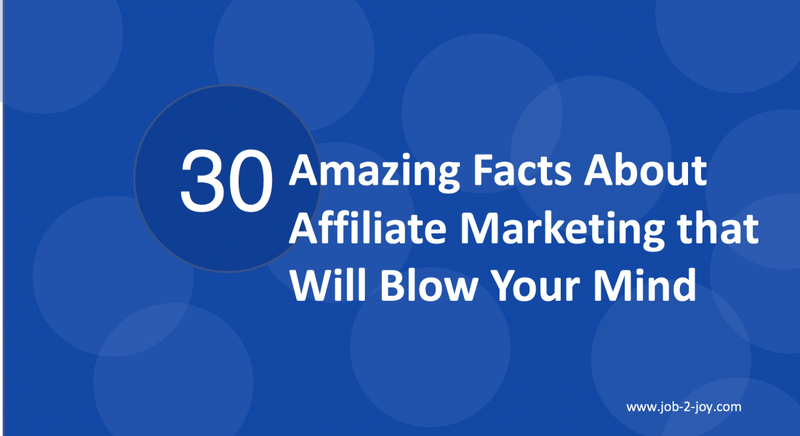 Thanks Kayla for taking the time to read this article on the 30 Amazing Facts About Affiliate Marketing. And thanks also for you awesome comment. You are never too young to start affiliate marketing. I was chatting with a kid from high school the other day and giving him encouragement to pursue affiliate marketing even from now. To answer your question about the average income being under $20,000 a year, the information does include those who drop out. I believe this is one of the biggest issues in affiliate marketing. A lot of people have false expectations. They think they could do very little work and expect to get rich overnight. I was chatting with a guy from Wealthy Affiliate the other day. He had started just two weeks, added about 3 pages and 2 posts and was wondering why he didn’t start to get any sales as yet. People have poor expectations about affiliate marketing, because there are many people out there providing false advertising. Or they show income levels that are not normal. once you follow the tried and tested systems you really can’t go wrong.